Takedown rifles, like Ruger’s new 9mm PC carbine, break down easily for compact storage, making them ideal when space is at a premium. Looking back, I’ll give credit to the 1962 film “The Manchurian Candidate” for sparking my interest in takedown rifles. The Japanese Arisaka Type 99 Type 2 Paratrooper’s rifle, incorrectly referred to as a “two-piece Soviet Army sniper rifle” in the movie, added more edge to an already cutting-edge film. When the would-be assassin neatly assembled a bolt-action sniper rifle from a compact case, I was amazed. I became intrigued by the concept from a mechanical point of view. The idea of a rifle easily broken down into a few major components—allowing easy transportation in a small case—and then quickly reassembled seemed awfully attractive to my young mind. Hollywood has long had a love affair with the concept of a rifle that could be easily broken down into major components, allowing it to be stored in a compact case. Unfortunately, such roles typically portrayed takedown rifles as being intended only for nefarious purposes on the big screen. While the allure of a takedown rifle is obvious, outside of the big screen they were mostly used for far more mundane tasks. A takedown rifle is simply one that disassembles to allow it to be stored in less space than a conventional rifle. If space is limited in your motor vehicle, plane, luggage or backpack, then such a firearm has real merit. Due to their compact nature, takedown rifles have long been popular as “survival” guns because they can be neatly stored away until required. Removing 16 inches or more from the front of the receiver can dramatically shorten a rifle far beyond what a simple folding stock can accomplish. Of course, there were downsides to the early classic takedown rifles—namely cost, accuracy and the need to reassemble the rifle before use. Exquisite early 20th-century bolt-action takedown rifles tended to be carefully handmade by custom builders, which meant they were expensive. And because the the barrel and fore-end had to be easily removed from the action, repeatable accuracy or point of impact was not necessarily up to par with a rifle of conventional design. This was especially true if the rear sight, or an optic, was mounted to the action rather than the barrel. Plus, the rifle would need to be assembled before use, so it was not “instantly ready” when broken down—which wasn’t a big deal for hunters. Modern takedown rifles aren’t plagued by these concerns, at least not to the same degree. Many, but by no means all, are based upon Eugene Stoner’s and James Sullivan’s popular AR-15 design. While the various designs differ, they all share the common feature of being able to be easily broken down into their major components for compact storage. In certain cases, they also facilitate rapid caliber changes as well. Just how small of a package they end up in depends upon the design, if it incorporates a folding stock and the barrel length. Perhaps the most impressive demonstration I have seen of the compactness possible with a takedown rifle was given by the owner of Pantheon Arms. He walked up to a table to give his presentation with a common .50 caliber ammo can. Without saying a word, he opened the can and with one hand pulled out an AR-15 SBR with side-folding stock minus barrel assembly. With his other hand he pulled the barrel assembly, outfitted with his Dolos Take-Down system, inserted it into the rifle’s action, gave it a partial turn and locked it into place. He then snapped the stock out. Reassembly took perhaps four seconds. Base price of the Dolos Take-Down System for a standard AR-15 is $185. An older but well-proven system—originally developed by MGI and now offered by Windham Weaponry—is the MCS. Offered as a complete multi-caliber package, it allows the user to easily remove not only barrels but also the magazine well, to seamlessly swap between calibers and magazine types. A shooter can easily swap Windham Weaponry’s MCS from, say, 7.62x39 to 9mm in less than a minute. He can also easily break the rifle down for compact storage. One MCS package offered, which includes 5.56x45, 9mm and .22 rimfire barrels, bolts, magazines and backpack, retails for $2,495. Probably the best known takedown rifle is the 1950s vintage AR-7 designed by Eugene Stoner. A compact 3.5 pound semiautomatic .22 LR, it comes apart easily, and the components can be stowed in the hollow buttstock. Today the AR-7 is manufactured by Henry and retails for $305. A bit more traditional is Marlin’s Model 70PSS Papoose .22 LR. This features Marlin’s classic Model 60 semiautomatic action with an easily removed barrel. Feeding from a detachable box magazine, the 3.2-pound Model 70PSS Papoose has a cult following among shooters due to its light weight, compact size, reliability and accuracy. Ruger entered this market in 2012 with its 10/22 Take-Down. The Model 11100 retails for $439, weighs in at 4.6 pounds and splits neatly in half to stuff away in a pack or bag. Each of these rifles has its own merits. All three are easily capable of putting meat in the pot and are fun on the range. Ruger’s recently introduced 9mm PC carbine is the latest entry in the takedown rifle market. A pistol-caliber carbine, it has a similar tool-less takedown method to Ruger’s 10/22 Take-Down model. Not only that, but you can also swap magazine wells to allow it to feed from Ruger or Glock magazines. Fitted with a robust black polymer stock, the PC carbine weighs in at 6.8 pounds and retails for $649. If you prefer a true precision rifle, LaRue Tactical’s PredatOBR features a removable handguard and barrel for both easy storage and rapid caliber swaps. The free-floating handguard is easily unlatched and slid forward exposing the barrel nut. This is then unthreaded, allowing the barrel to be pulled free. 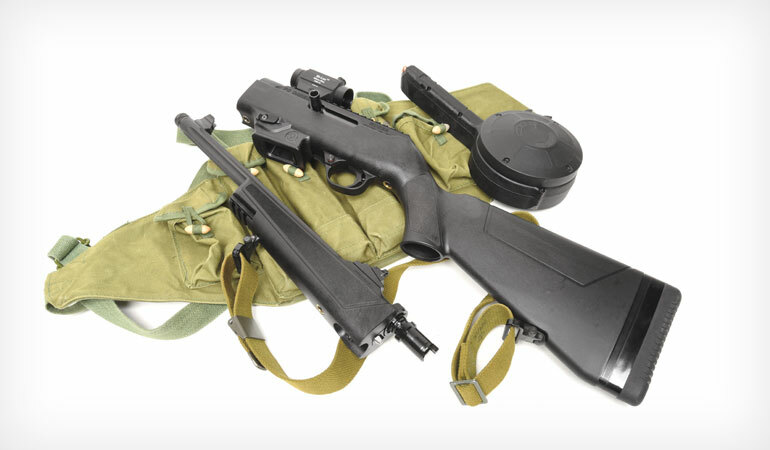 With the barrel assembly removed, the rifle fits easily into a pack or bag for discreet carry. Available in barrel lengths from 14.5 to 20 inches, the PredatOBR’s suggested retail pricing starts at $3,469. While not everyone has the need for a takedown rifle, they are a viable option if space is at a premium. Modern designs are typically easy to use, simple in form and suitably accurate for their intended purpose. For certain situations they are hard to beat.